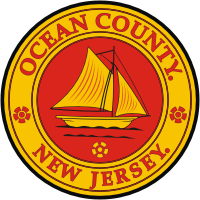 Ocean County is located in the Atlantic Coastal Plain in central New Jersey. The County is the second largest in the State in terms of size and one of four New Jersey counties which border the Atlantic Ocean. Toms River, in Dover Township, serves as the County Seat and is centrally located within Ocean County. The County is in close proximity to two of the Nation’s largest metropolitan centers, New York City approximately 60 miles to the north and Philadelphia roughly 50 miles to the west. In addition, Atlantic City is located approximately 50 miles to the south of the County Seat. These metropolitan areas are easily accessible to Ocean County via several major highways, as shown on the Regional Location Map. Although Ocean County has been settled since colonial times, its presence as a separate political entity is of relatively recent origin. The County was created from lands divided from Monmouth County in 1850. For much of its early history, the County was a rural, agricultural and fishing center. During the latter part of the 1800’s and through the 1900’s, the resort industry of the New Jersey Shore was developed, and the commercial activities associated with seasonal resorts quickly became the County’s economic mainstay. In the early 1950’s, there began a nationwide trend towards suburbanization as people moved outward from the older urban centers into previously sparsely populated or rural areas. The opening of the Garden State Parkway in 1954 permitted access to a large amount of undeveloped and inexpensive land within commuting distance of the labor markets of New York and northern New Jersey. The County also became a desired location for people who wanted to retire away from the more industrial areas to the north. A primarily rural County with a population of 37,675 in 1940, the County’s population increased to 433,200 persons by 1990. As evidenced by each of the decennial Censuses during this fifty year period, Ocean County was the fastest growing county in the State. Almost all of this growth was due to in- migration, rather than the natural increase of the population. Development in Ocean County has traditionally occurred along the coastal beaches and in the corridor formed by the Garden State Parkway and US Route 9. Major interchanges along the Garden State Parkway have encouraged development along eastwest corridors, such as County Routes 526 and 528; State Highway 37 and State Highway 72. Interstate 195 is a relatively new highway which is playing an increasing role in the development of the northern portion of the County. The Interstate provides direct access to the major employment areas of Trenton, the State Capitol, to the west and Monmouth County to the northeast. With the growing year round population, Ocean County’s economic base has become increasingly diverse, with a variety of industries now supplementing traditional tourist related businesses. The growth in employment opportunities within Ocean County is now becoming as notable as the population growth was in the recent past. Over the last ten years, Ocean County has had one of the fastest increases in new jobs in the State. The Health Care Industry has been by far the fastest growing employment sector and is now the top employer in the County. Employment projections released by the NJ Department of Labor show that Ocean County will continue to be at the forefront of New Jersey employment growth well into the next decade. Despite the large growth in population and employment, Ocean County maintains a vast amount of protected open space which will ensure the balanced land use of the area in the future. Much of the area west of the Garden State Parkway contains large tracts of State Parks, Forests and Wildlife Management Areas. In addition, approximately 20,000 acres east of the Parkway are protected under the Edwin B. Forsythe National Wildlife Refuge. The Barnegat Bay and Little Egg Harbor, which stretch nearly the entire north-south length of the County, were recently added to the US National Estuary Program and will be the subject of continuing environmental protection efforts. In the northwest portion of the County, active farmland is being preserved through the County Farmland Preservation Program. To date, over 1,580 acres of productive farmland have been preserved just outside of New Egypt, in Plumsted Township. In addition, the Ocean County Parks Department maintains an active capital program for parkland acquisition and development to ensure that a variety of recreation opportunities are in close proximity to residents throughout Ocean County. As always, the coastal beaches of Ocean County are foremost among the County’s attractions and continue to draw thousands of seasonal visitors to the area each year.